Project Bread raised over $3 million as more than 40,000 people participated in Sunday’s 20-mile Walk for Hunger, including various members of the MIT community. Some students walked with their friends, while others came as members of large organizations. MIT’s Hunger Action Group turned out for the walk, and for the first time the Interfraternity Council attempted to organize a group of MIT students. “Organizing students for the walk for hunger was Dan Stiehl [’02] of No. 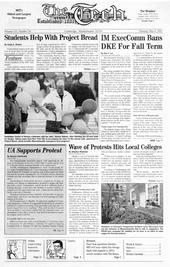 6’s idea,and the IFC Community Service Committee worked to organize and promote it,” Yoo said. “This is our first year and it was a great start, but next year we are going to make a lot of improvements, such as including all members of the MIT community: faculty, staff, alumni, families. We would also like to get everyone walking in a block, wearing MIT Walk for Hunger t-shirts,” Yoo said. Project Bread started its annual Walk for Hunger in the Boston Common on Sunday, May 6. The walk is the primary fundraiser for the organization, and it usually draws a large number of participants, who solicit sponsorship for the 20-mile trek from both individuals and businesses. The organizers of the Walk for Hunger provided breaks, entertainment, and encouragement to the participants. Nine checkpoints located throughout the course allowed participants to obtain free water, first aid services, chairs for resting, and even bus rides back to the Commons. Food vendors were plentiful, and the sponsors of the walk also provided free snacks, juice, and lemonade at various points along the course. Free Ben & Jerry’s ice cream was provided to all walkers who crossed the finish line. Bands performed types of music throughout the walk, ranging from African percussion rhythms to chamber orchestra to a capella. The organizers even provided a stage at the midway point where a live rock band played. Kiss 108 provided musical vans which played alternative rock music at several of the checkpoints. The course itself was peppered with signs containing words of thanks and encouragement, the occasional mile marker, and facts about the number of hungry families and children in Massachusetts. These provided encouragement and a sense of purpose for the thousands of participants who traversed the 20 mile course. The wonderful weather no doubt contributed to the large turnout. The sun was warm and bright but the air was cool and refreshing, perfect conditions for a walk that required five to eight hours to complete. The 20-mile trek started at the Common, continued down Beacon Street to Chestnut Hill Reservoir, then went on to Newton, where walkers then made a slow loop back towards Boston, followed the Charles River through Watertown, and eventually made their way onto Memorial Drive. Participants continued down Memorial Drive to Massachusetts Avenue, where they crossed the bridge and headed down Commonwealth Avenue, through the Gardens, and finally back into the Common. Many different types of people participated in the walk, ranging from families with small children to corporate teams to groups of high school and middle school students. Everyone had his own strategy for making the walk seem less tedious, like singing camp songs and bringing along radios and Walkmen, or breaking out a pack of cards at each checkpoint while taking a small break. “All of the volunteers were happy, some were singing, ... everyone was just in an overall good mood,” Deardon said. According to Project Bread’s website, one in five Massachusetts children faces hunger. Project Bread supports emergency food programs across the state, and they served served 29.1 million emergency meals in 1999. Rima Arnaout contributed to the writing of this article.